Our project was ambitious (code word: crazy), which will likely become apparent later in this entry. To address the theme, we proposed to embed a grid of threads between two sheets of handmade abaca that would gradually shift from dark to light from the four edges of the sheet to an asymmetrical center. We imagined that the fading thread, in this way, would subtly disappear into the paper itself, producing negative space, or a void of light and color within the finished sheet. Since this piece was to be produced entirely by hand, it was our hope that it would bring a human presence to the mechanized form of the grid as a means to explore the relationship between handmade and machine-made objects and how they are perceived. To create the grid, we built a lightweight frame out of balsa wood and measured and cut thin slits 1/8″ apart into the wood with an exacto knife. The slits had to be paper thin because our thread, #100 weight Japanese kimono silk thread, was about as thin as they come. Next, we cut each color thread to fit both the length and width of the frame so that they could be easily inset into the grid. We had to keep the threads taut after they were cut, because they tangled so easily. Then came the fun part: threading the grid. With 150 slots along the length of the frame and 100 along the width, each frame took roughly an hour to thread. We got pretty fast by the time we were done. To get the 152 samples that were required for the portfolio, we ended up threading 25 frames. Here’s a little math, just to contextualize the insanity: 100 + 150 = 250 threads per frame x 25 frames = 6,250 total threads gridded to complete this project. Still threading the frame. Man, this was some tedious work! Radha and I concentrate on lining the grid up evenly. Placing the grid. Scary stuff! We created two frames so that we could thread two grids at once. Once the grids were ready, we couched a thin sheet of abaca onto a felt and then carefully placed the grid on top of the freshly couched sheet. This required us to flip the frame, which inevitably caused some threads to sag and catch on each other. 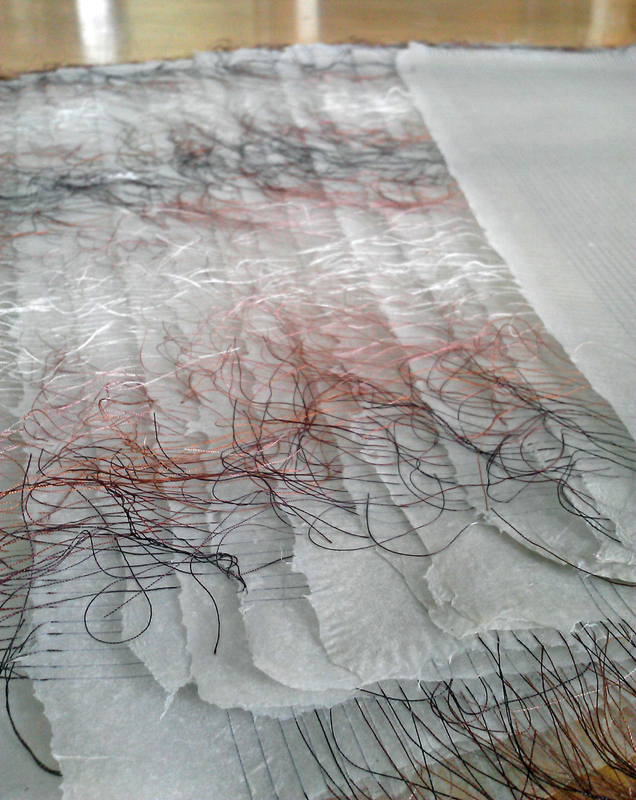 While suspended in mid air, we carefully pulled the loose threads taut with tweezers and laid the grid down. Detail of the grid and cutting guides. Couching the second sheet on top of the grid. Next, we formed and couched another thin sheet on top of the first sheet to embed the grid between the two layers. Pretty much every step in the project was nerve racking. 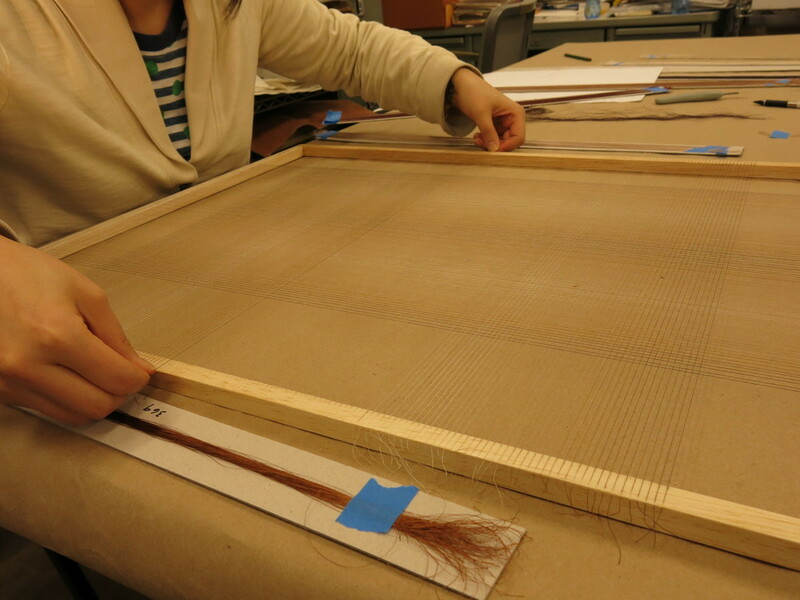 It took a bit of practice to realize that we could release the second sheet and cut the threads away to remove the frame after the second sheet had been couched. 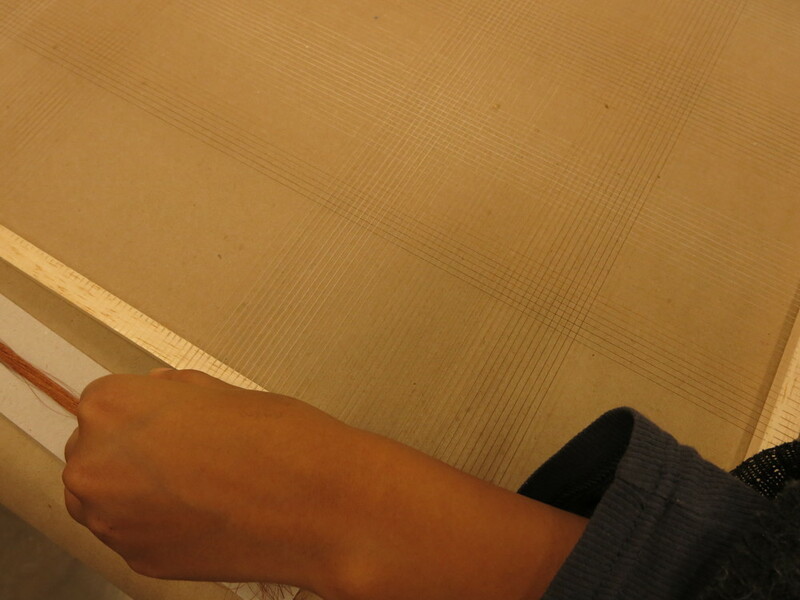 After couching the first sheet, but before laying down the grid, we placed four long strips of plexi at the outer edges of the sheet to use as a cutting surface. This allowed us to cut the threads and remove the frame without damaging the felts, and since the plexi was waterproof, it could be used repeatedly without having to be replaced. We pressed the sheets and restraint dried them in a stack dryer. Above is a detail of the sheets after they were dry and before they were cut down. Sorting firsts, seconds, and thirds. And, here they are! 152 samples ready to be sent off to Hand Papermaking. To learn more about the Hand Papermaking Portfolio Series, and Hand Papermaking Magazine, visit here.